There was an uninvited audience member spying on the Yankees' spring training workouts last weekend -- but it wasn't a member of an opposing team. 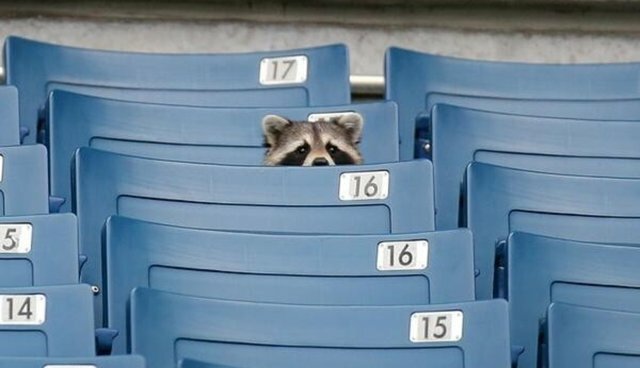 An inquisitive raccoon snuck into Steinbrenner Field in Tampa, Florida, and New York Post photographer Charles Wenzelberg was quick enough to catch it. "I heard this banging sound -- something fell, maybe it was a baseball bat, I don't know -- but it must have startled the raccoon because I see it running out of the Yankees dugout and into the stands," said Wenzelberg. "Its head pops up [over the seats] for a split second and maybe I caught two frames. I got lucky."